What is Transverse beam? It’s Function in Combined Footing. The traditional design method for foundation supporting multiple columns is based on beam design principle. Combined footing is designed considering inverted beam. This inverted beam has two or more supports depending on number and spacing of column. Columns are considered to support beam in longitudinal direction. In such footings, transverse beams are introduced to support this longitudinal beam to transmit pile reactions or soil pressure to columns. Actually column reactions are transmitted to transverse beam which transfer load to longitudinal direction, but inverted beams consideration turns upside down. Irrespective of support condition of footing, say may be piles or soil, transverse beam have to transmit loads to columns, thus every transverse beam should have capacity to distribute total load of respective column (supported by it) to footing. There have no standard to explain the width of transverse beam. Different recommendations refer us to fix width of this beam ranging from width of column to width of footing. So there have large variation in width of beam in engineering practice based of either principles of isolated footing or ordinary beam & slab concepts. When column width is taken as width of transverse beam, beam-slab design concept is established. In case of application of width as beam width, isolated footing design concept is used. But in usual practice width used lies in between two. 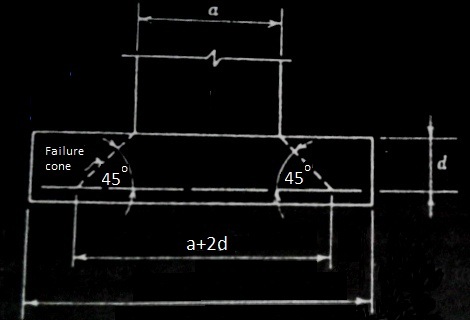 A rational width of transverse beam is established considering usual failure mode of footings as in following Figure. Transverse beams may have depth more than footing depth to form pedestals to have resistant against shear, bending or bond failure. In simple word, combined footing, longitudinally represent just beam; loads come from bottom side and spans between columns. In most cases, beams projects as cantilever from interior column as interior columns are loaded heavier than exterior one to coincide resultant of loads to center of gravity of footing. As beam is significantly wider than columns, transverse beams distribute column loads crosswise under every column. If footing is relatively narrow, the bending moment and shear on transverse beam will be small and required depth usually smaller than actual footing depth (designed for longitudinal shear, moment etc.). Thus these beams aren’t treated as distinct member. So transverse beam just represents here as transverse strips of footing and reinforced to have capacity to resist bending moments in transverse direction and respective shears. As a monolithic construction the strip just under column will not deform independently. A column of 24”X24” size is supported by combined footing of total depth 41 in. the column subjected to DL=250 kips and LL=200 kips. Footing width=6.5’. The depth of foundation is found from shear and longitudinal bending moment;now question is- should we check depth for transverse beam? Actually a 61.5” X 41” is quite enough for this moment. Only required steel area now has to be calculated. 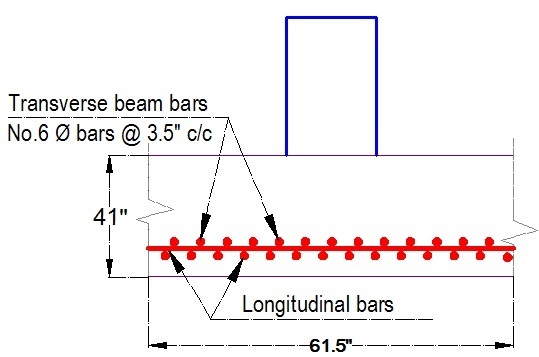 As reinforcing bars placed above longitudinal bars, the actual effective depth of transverse beam will less than 37.5 sat d = 37.5-1 = 36.5 [considering No.8 bar]. i.e. no more iteration is required. 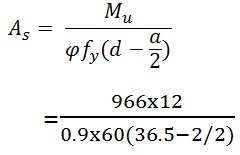 Thus required As=6.07 in2. The controlling value of minimum reinforcement is 7.48 in2 which is more than bending requirement of steel, 6.1 in2. Thus minimum steel area controls here. Punching shear is checked while selecting depth 37.5”, this lies d/2=37.5/2=18.75” distance around the column. Though here our depth for transverse beam is 35.5”, relatively small punching perimeter is achieved; thus concrete shear capacity will be reduced. But shear force in the transverse beam would be much less than longitudinal shear force. So punching shear check is not required. 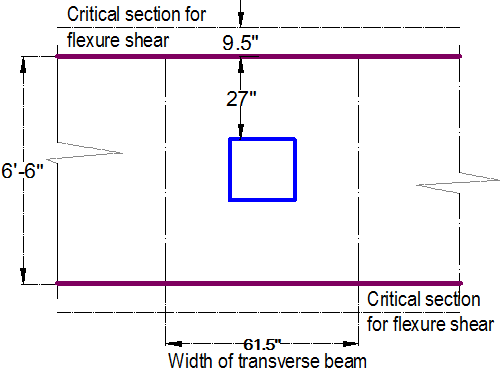 Again flexure shear/beam shear check is not also required as critical section for shear lies beyond (distance from column face) edge of foundation [9.5” outside from edge of foundation, (6.5”X12-24”)/2-36.5”=-9.5”]. 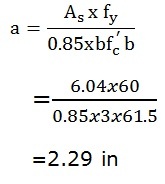 The required steel area=7.48 in2.Seventeen No.6 bars are required, that is No.6 bars at 3.5” c/c within the width (61.5”) of transverse beam is enough.